Recently I explored the northern part of Everglades National Park along Florida US41. One morning there was patchy fog that turned out to be a nature and wildlife photographer's delight. The set up for the three Everglades Wood Storks opened up not far from the intersection of FL29 and US41 where several roadside ponds are present. 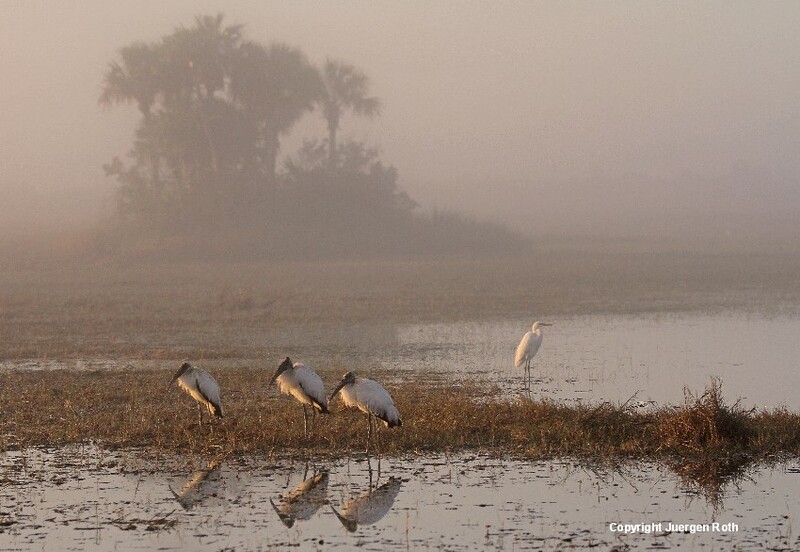 The roadside ponds are small bodies of waters close to the road that attract lots of wading birds like ibis, egret, heron or the endangered wood stork. Attracted by the beautiful and promising scenery in front of me, I immediately pulled over. The first light of the morning was breaking through the fog and the Florida palm trees provided a wonderful backdrop for a hint of the location. The reflection of the wood storks and the egret to the right including the soft light hitting the birds provided the icing on the cake. I set up Tripod and equipped my camera with a 1.4x tele converter and a 70-200mm lens to frame the Wildlife within the foggy landscape. The wood storks were on a constant move, chasing their breakfast but then, once in a while, always stopped to rest for a few seconds. These were the seconds when I released the shutter to freeze the moment with my camera. The camera aperture was set to f/4.0 resulting in a shutter speed of 1/400 seconds. ISO was at 100. During post processing I minimally adjusted lighting, contrast and color saturation before sharpening.